The catchphrase "The name's Bond, James Bond" is the best-loved one-liner in cinema, according to British film fans. Bond's defining catchphrase was closely followed by the Terminator's "I'll be back" and Humphrey Bogart's "Play it Sam". More than 3,000 cinema-goers were asked which was their favourite movie motto of all time. Only one saying by a female appeared in the top 20. "Why don't you come up some time and see me", uttered by Mae West in 1933's She Done Him Wrong, was at number 18. The survey proves that if a film catchphrase enters popular culture, it stays there. Unlike many surveys of favourite films and albums, the top spots were spread over a long period, with the most recent of the top five created in 1984. But there are more up-to-date sayings on the list - Jerry Maguire's "Show me the money!" is at number nine, and Leonardo DiCaprio's "I'm the king of the world!" 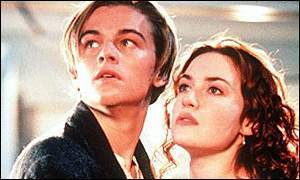 from 1997's Titanic came in at number 11. Along with Mae West's unforgettable utterance, Laurel and Hardy's "That's another nice mess you got me into" meant there were two sayings from the 1930s in the top 20. Bogart's "Play it Sam", from Casablanca, is usually mis-quoted as "Play it again Sam". Favourites also include such immortal catchphrases as "May the force be with you", from Star Wars, Toy Story's "To infinity and beyond", and Dirty Harry's "Go ahead punk, make my day". Media students at London's City University questioned film fans at cinemas to compile the list.